With Amelia's first birthday drawing closer everyday I have been searching high and low for some gifts. I didn't really want to buy her toys as such as she has a ton already and other people are bound to buy toys too so I opted for more of a purpose or keepsake ideas. I have been looking for a play tent for Amelia for some time now but haven't really found one that I like or that is girly. So when I found this one I fell in love! Can you imagine Amelia playing with her friends when she's older and have little tea party's in the wigwam how adorable! I have also been looking at children's armchairs and haven't really come across any that I like, although this one from Ikea isn't too bad and you can buy customised covers on Etsy. I have been thinking about getting Amelia a rocking horse but I just can't decide on which one! They're both just too adorable and I cant choose! Which one do you prefer? What did/will you get your little one for their first birthday? It's all about the rocking horse! I still have mine from my first birthday, and I plan to give it to Bea on her first birthday. My aunt is pregnant with a baby girl...and she'd love those stuffed bunnies! I have no idea what to get Hayden Eeek! My little girl is one soon, I would love to get her the you box, I love it! Couldn't get the link to work though, where is it from? Love the teepee, so adorable! What fun!!! Both rocking horses are stinking cute. Mine is more generic, blah...but I loved it as a kid and am so glad my mom kept it. Those are SUPER cute ideas! We got my daughter a tent for her 1st & she LOVES it! She also got some new textured balls to play with! I think it's so hard to find things when they are so little. With her 2nd birthday she got musical instruments & a huge ball for the yard, and Mickey & Minnie Mouse things (her newest obsession!) I'm hoping the 3rd birthday will be much easier to plan for! Found you through the Bloglovin' link up! New follower! How about a chalk board? (You can even make one yourself from chalkboard paint and frame it out to fit your decor.) You can use it now to write on to teach her things. Put it at a low level, then when she is a tad bit older she can draw and practice writing on it. Then as she grows you can move it higher, etc. and as a teen she can write down important dates or sayings that have meaning for her. What fun birthday gift ideas for a little girl. I love the tepee. I'd get the second (anabel) rocking horse. That's too cute! I love the little tent! I would have loved that as a kid. OMG @ the rocking horse! So cute! 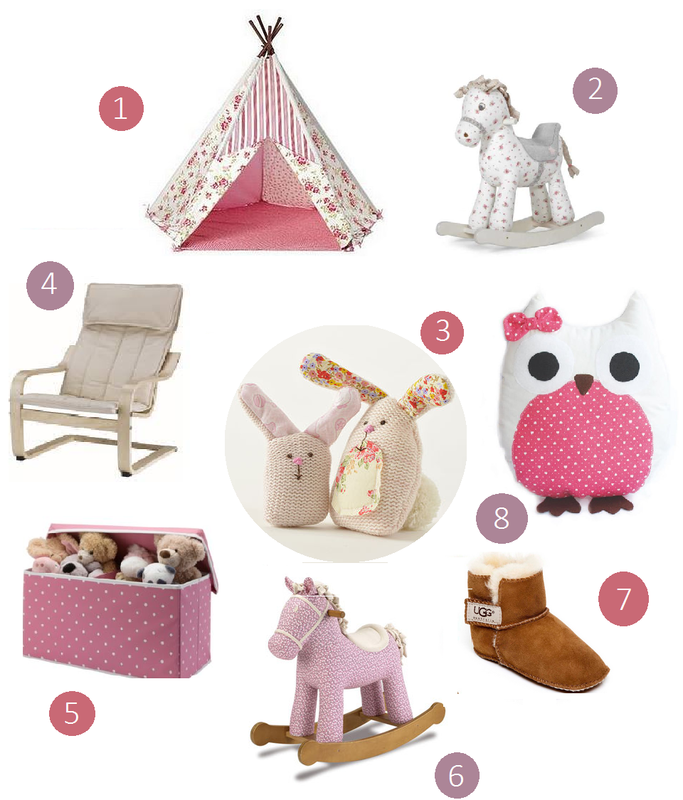 I adore the Pink Plush Rocking Horse and the Mummy & baby bunny are so adorable! Soooo cute, I adore that little teepee! The owl is so freakin' cute! The #6 rocking horse is my favorite. The tradition in my family is for the grandparents to buy a rocking chair on the child's first birthday. Then, instead of a big gift, we as parents, throw a huge party to celebrate! Oh I love it all. My little girl got a rocking horse for her first birthday and she still absolutely adores it nearly a year on. I'm absolutely addicted to owls at the moment, so have bought a very similar cushion recently. The teepee is my favorite! Definitely that! I don't have any little ones yet, but I am in LOVE with that adorable teepee!! I like the pink rocking horse better (#6). Such cute girly gifts! Especially love the tent! Love the rocking horse! We got our daughter an anywhere chair from pottery barn. She's 4 now and still loves it. I'd get that teepee - so cute! Little ones seem to like there own little hiding places like that. I suppose that's why we have 4 different tents of that sort in our own house haha. Not sure which I like most... #1 or #2 - that rocker is ADORABLE! That rocking horse is amazing! I think I will buy a few toys and some handmade items. I love those stuffed bunnies. They are the best! I adore the little Rocking Horse - number 2! So girly! everything is SO cute. i really hope i have a little girl first, i'd have so much fun shopping for her! Girls are so much fun to shop for :D I used to hate pink but now its my favourite colour haha! The owl is to die for! I LOVE the rocking chairs! Number 6 is my favorite :) I have been looking for a bear rocking chair for ages! They're both gorgeous! My daughter still refuses to part with hers and she's 11! Love the owl and the little tent! I'd get one of the two rocking horses. the teepee IS VERY PRETTY! BTW I am a new follower! I love the Rocking Horse (no 2), my little boys both still have theirs from their first birthdays. We bought our little one a Little Tikes 3-in-1 Trike, he loves being outdoors so it was a great way of getting out and about and I can adapt it to his requirements as he gets older. Perfect for little ones to get lots of fresh air and burn off some energy. Too cute! Especially the teenie tiny UGGs! I love the chair from Ikea it looks so comfy. That wigwam is so cute! My older daughter who's 4 has the Ikea chair and her 1 year old sister loves it, for some reason she just loves finding things to sit on. As we have so many toys aswell, for my youngests first birthday we bought her clothes so she had something new rather than hame-me-downs from her sister. My little one is only seven months old but I have been thinking about his present. Apart from a gift, I want to bake him a nicely decorated cake with fondant and cute colors. And his grandma wants to give him a rocking horse. Those on the list are so cute! The rocking horse is the cutest ! Definitely go for a rocking horse, it is something that can be treasured forever and passed down. I personally love the number 2, more expression to it. Uber cute! My first grandchild just turned 6 months old & my daughter is already planning her first birthday party. My fav is the pink rocking horse. LOVE the teepee! I got something similar for my daughter's birthday, as well. She loves it. I like the Anabel rocking horse. These are so cute! The owl is too sweet. I love that owl. Adorable! I would probably get books...because I love children's books so would love to to use a first birthday as an excuse to get more. My 3 girls would absolutely love that teepee! The rocking horse - I loved mine all through childhood, even when I was far too old to sit on it! i think the horse in picture 6 is better looking. I love 2 and 8.. adorable gifts! I love num. 1 and 6!!! Those bunnies and the baby uggs too too cute! I love both! I think I love the TeePee the most! My daughter would adore it! Loving the Rocking Horse, I'd go with that. Definitely number 1 the tent style thing, would provide hours of fun and excitement! I like the shoes because seems like kids go through shoes like water. They grow so fast! Congradulation! I'm so glad you linked up the contest to this page. Great, great, great gift ideas for new babies!!! the play tent is sooo great! My girl did receieve a rocking horse - pure wood with leather, epensive - but was never keen about it. So i vote for the tent! Definitely the teepee wigwam! I can picture her curled up in there with her blankeys and stuffed animals watching tv or sleeping! I love that tent. It's so pretty. Those items are so darling! Ohhh my estrogen. I love the Rocking Horse! It reminds me of mine when I was younger. Every little girl wants a horse - so that'd be my choice. Don't know what I got for my first birthday but I loved my rocking horse and still have it. Both of the horses are so cute :) Happy Birthday to Amelia! That cute little tent! Definitely the tent! I remember loving tents and forts when I was little :) Happy B-Day Amelia! I love the pink horse and I love the teepee!!! These stuff are such a cutie...but if I were to choose, I would prefer rocking horse #2. I think ever little girl should have a rocking horse! I personally would choose rocking horse #6. :) Happy birthday, Amelia! I love the little wigwam tent =) We bought our little boy a pop up tent for his 1st birthday and he loved it! the rocking horse is so lovely. The rocking horses are adorable! OMG I totally love those little UGG boots and the owl! so cute! I love rocking horse number 2, but they are both really nice. My granddaughter is one, I bought her activity toys for her birthday, but I think I would have bought one of these if I had seen them before now, she would have loved them! madе mе rеаd it all. Μine alwayѕ seem to drag on, yourѕ is ѵeгy punchy. Very nice post for birthday gift and kids party return gift with nice view image touch ,m very happy to this blog its very nice Birthday party organisers in Ghaziabad . possessions from our props to our atmosphere to our superstars WWE2K18 well as he seems rather psyched to be included in the video game. OS for smartphones throughout the globe other than Apple gadgets. appvnapkdownload Appvn Plus is an independent market for android and also ios applications. it's high time we got to really completing the MYBKEexperience.com survey. MyBKExperience The survey is online, so you need internet gain access to.